Discover which sunglasses are worn by some of our top pilots and find out about a range of sunglasses designed for glider pilots by glider pilots in the Aug/Sept issue of S&G. You can also read about an impressive flight, just short of 500km, from Tibenham to Truro in an Oly 2b, plus there is a fresh look at advanced manoeuvre training. The sight of a pilot sitting on the grid with a pair of reading glasses perched on the end of his nose, outside regular sunglasses, is not uncommon. Lasham’s Bill Bullimore was inspired to address this problem, with a resulting range of sunglasses with reading lens inserts and for those who normally wear prescription glasses. The FARSIGHT range is among those listed as the sunglasses of choice by some of the UK’s top glider pilots. With Olympia 2b ‘BRL’ reaching 54 years of age, Rob Lockett decided it was high time this classic glider finally flew a ‘proper’ cross-country of at least 300km. On 5 April, Rob’s daydream of an old fashioned downwind dash to Devon or Cornwall became reality, with a 496km flight from Tibenham to Truro. The longest UK flight previously recorded in an Oly was Bill Bedford’s 413km flight from Farnborough to Newcastle on 2 May 1951. A stroke of genius saw Spain’s Aeroclub Barcelona-Sabadell promoting Fox aerobatic flights as a safety course. This approach made the prospect of aerobatic training more inclusive and less elitist, ensuring a broad demographic of pilots eager to learn something new and become better pilots. Aerobatic flight examiner Guy Westgate, who put together a training package for the Spanish instructors, is confident that every student expanded their knowledge. Language was not an issue, as most Spanish pilots speak excellent English. However, after a misunderstood English instruction to ‘turn around’, followed by an unplanned roll attempt joining downwind, Guy discovered that ‘turn around’ sounds like the Catalan ‘tourna’ – to do it again. He quickly learnt the Spanish ‘girar’, pronounced ‘heera’ – to turn! The frequency of tug upset incidents has increased in the UK over the past few years. 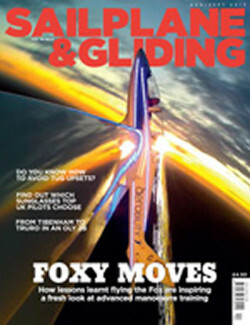 About 30 years ago, the BGA embarked on an intensive educational campaign to teach glider pilots how to avoid tug upsets. Fatal accidents stopped and the tug upset incident rate declined. Now, with incidents increasing again, Hugh Browning outlines some valuable advice for safe aerotowing. Also in this issue: BGA Chief Executive Pete Stratten reports on the progress of the licence conversion process and highlights BGA support for the challenges ahead. Phil Jones reports from the Unflapped Europeans at Vinon, France, where he experienced one of his top three flights ever. Bernard Eckey explains why it is always essential to expect the unexpected. Shaun Lapworth visits the Winter factory in Germany, where the Rolls-Royce of gliding instruments have been individually crafted since 1931. Mike Young looks at the potentially higher risk of serious damage or injury caused by mishandling of the engine, as increasing numbers of us join the ‘turbo club’. BGA Chairman Pete Harvey highlights how the BGA is managing change and protecting gliding at a time when we’ve some huge changes affecting ops within clubs. Mike Bird recalls bringing ASH 25 ‘13’ to Dunstable in 1988 – the first 25 to be imported into Britain. Kerry Mertz looks at the Nene Valley GC Flying Scholarship Scheme, which has seen the club team up with Abbey College in Ramsey. Aspects of gliding have been introduced to the physics GCSE curriculum for students of Abbeyfield School in Chippenham, Wilstshire, who are also enjoying flying at Bannerdown. BGA Development Officer Alison Randle explains how clubs can benefit from shared experiences. Bruce Stephenson asks if wood and fabric has been relegated to the shadows of British competition. Chris Scutt reports on the Haddenham Vintage Rally. BGA Chief Technical Officer Jim Hammerton comments on the results of a recent survey of BGA inspectors. Robert John explains how your generosity can go even further, as the BGA takes on the Caroline Trust fund as its favoured charity. Last, but not least, there are many more of your stunning images in the Gallery pages.